Janis Lieberman has performed worldwide as an orchestral and chamber musician. Originally from Washington, D.C. she also lived in Asia and the Middle East. 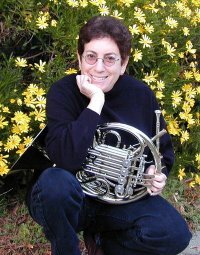 For several years, she was Principal Horn with the Israel Sinfonietta and Israel Chamber Orchestras as well as performing regularly with the Jerusalem Symphony. During her time in Israel, Ms. Lieberman served on the faculty of the Rubin Conservatory of Music. Upon her return to the U.S., she performed with the National Symphony and Kennedy Center Opera Orchestras. In the bay area, Janis is a member of the Sacramento Philharmonic Orchestra, Sacramento Opera Orchestra, Sacramento Choral Society Orchestra, the Bear Valley Music Festival Orchestra, and has also performed with the San Francisco Ballet and Opera orchestras. An accomplished chamber musician, Ms. Lieberman is a founding member and manager of Sierra Ensemble, a violin, horn and piano trio. In seeking to provide opportunities for composers to create new works for such a unique combination, Sierra Ensemble has commissioned composers near and far. Recently, the trio received grants from the U.S. Department of State and CEC ArtsLink to inaugurate the Turkish American Composers Project. A collaboration between Sierra Ensemble, Turkish university students and their professors, the Project featured seminars and performances in Istanbul and Ankara in the Spring of 2013. Ms. Lieberman was a recipient of an Israel-American Cultural Foundation Scholarship, affording the opportunity to study with Meir Rimon of the Israel Philharmonic. She received her Bachelor of Music degree from Boston University School of the Arts, and her Master of Arts from San Francisco State University. Ms. Lieberman has shared her expertise as a public school instrumental music specialist, and currently teaches privately in the East Bay.